June 8th, 2014 Spencer and I last-minute decided to go to church with my parents, not knowing what the pastor would preach on. We got there and the pastor began to talk about Baptism. I knew right then and there God placed us at Clover Hill AG that morning for a reason. 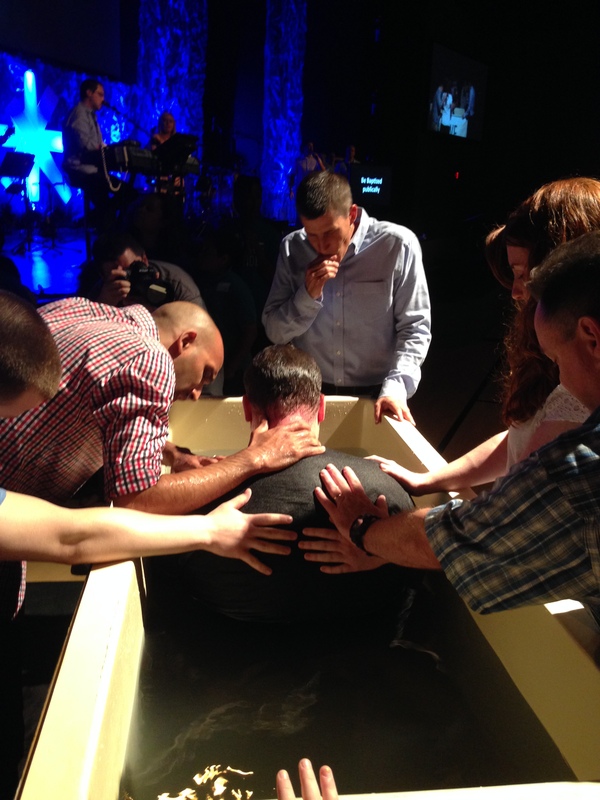 The message was clear, direct, and filled with scripture supporting the observance of Baptism in a believer. I had not known this, but on one particular occasion my mother and Spencer had discussed the importance of a man in leadership within a relationship, and the importance of putting Jesus first. “Before you ask my daughter to marry you, would you pray about your “marriage” to Jesus?” They specifically discussed his obedience in following through with baptism. 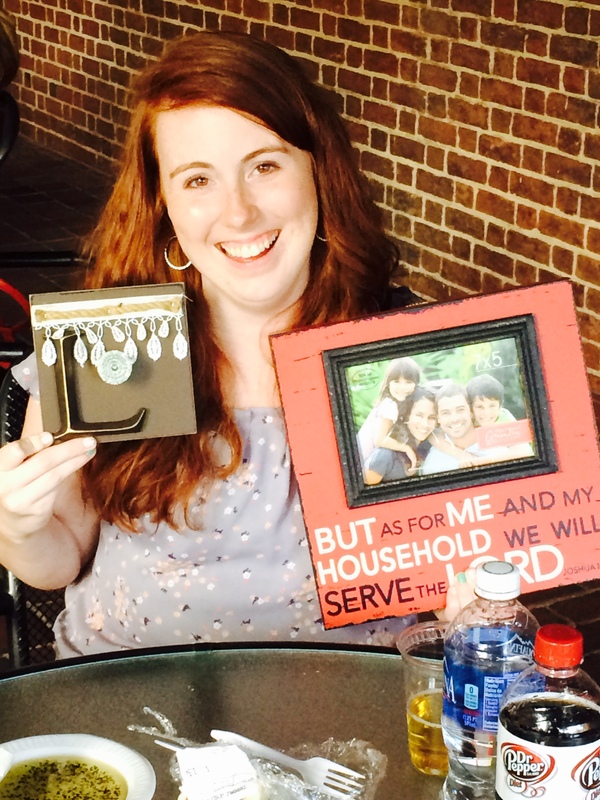 What a gift more treasured –even more treasured than a diamond ring on her hand–baptism. He had made a profession of faith and committed his heart to the Lord; yet, the observance of baptism had not followed. Life goes on, more stories are made, and Jesus is working His way. That Sunday, the pastor shared that our wedding band is the symbolism of “I belong to my spouse” and Baptism is the wedding ring of “I belong to Jesus”–publicly announcing who you belong to, a symbolism. How could God orchestrate this moment, us being there “randomly”, the message on Baptism, and the message having the same discussion they had together months previously? How could God know that the wedding ring example would mean so much to us as a couple? How? Because God is the GREAT I AM! 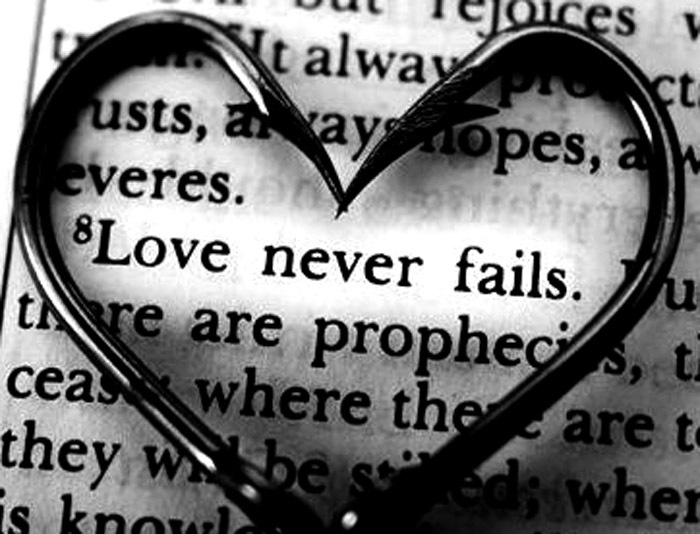 He is faithful and true. Throughout the service I could feel that THIS was the day, the day Spencer would choose to obey Christ and chose that he wanted to publicly profess that he belonged to Christ alone and would one day lead a family in His truth. The church offered for those wanting to be baptized that day! Spencer smacked my leg and I looked up, those two little words, “Let’s go!” and I just knew it, God placed us here on this day! Spencer was baptized! Another thing I learned later…Spencer picked up my engagement ring that afternoon! What symbolism! God is good! Fast forward to June 20th, 2014. I headed to my parents house to drop off my sweet dog, Bradley for the weekend. Spencer and I were going out-of-town to a concert in Virginia Beach. Also, Spencer had said he wanted to go to the Outer Banks on Saturday for a day. Outer Banks is one of our favorite places to be, and we would already be halfway there, so we thought we would take advantage of that! Spencer and I headed to the concert and had a wonderful time – we saw Tim McGraw and laughed and danced the night away. We woke up the next day and were SO excited to get to the Outer Banks and put our toes in the sand! We got to Nags Head around lunch and after looking in a few shops we headed to one of our favorite spots, FatBoyz Ice Cream and got some lunch – nothing like chili cheese fries on a hot summer day! After that we headed to Jeanette’s Pier where we found our spot in the sand, popped up the umbrella and relaxed. We people watched, talked, listened to music…and then it began to rain. We decided we didn’t want to hang out in the rain since we were wanting to go to dinner that night and had no where to really change since we weren’t staying that night….or so I thought. We ended up changing in the bath houses at Jeanette’s Pier (always interesting, haha) and then because it was so early for dinner, we both decided heading to Manteo would be fun! I love looking in the shops in waterfront Manteo, and my favorite lighthouse is there too, Roanoke Marsh Lighthouse. We got to Manteo and ended up having to park on the opposite side of the area from the lighthouse…to me this was no big deal, we are closer to the shops…but to Spencer, looking back, he was going to have to improvise. We got out of the car and Spencer had his camouflage backpack on. Weird. I asked him why in the world he wanted to carry a backpack around, and, he said, since I had my little purse and not my large one he wanted me to have somewhere to put anything I were to buy while we were looking in shops. “What do you think I’m going to buy, Spencer”? (Haha) I told him he was turning in to my dad. He always carries his red backpack around when my family goes out on day trips. Spencer laughed, and we walked toward the shops. The first place we stopped was the cutest little dog boutique. It caught my eye because they had a Westie flag out front, and we all know how much I love my Bradley. We looked around in there and I ended up buying a card. Spencer immediately suggested he could put it in his backpack to carry. I guess he was trying to prove his point– we needed a backpack to carry stuff. We looked in an antique shop where Spencer had a long conversation with the gentleman working there. When we left, Spencer seemed anxious, and I asked him if he was okay. He smiled and nodded yes. We went to a few more stores and then after exhausting them, Spencer suggested we go see my favorite lighthouse! We walked around on the dock for a few minutes and then ended up in front of the lighthouse sitting on a picnic table bench holding hands and talking. We laughed because the bridge in the far off distance made it look like the cars were driving on the roof of the houses on the sound. We watched as people rowed by in kayaks. I was speechless, I nodded my head yes as tears of joy streamed down my face. In my head I thought, “YES! YES! YES! Of course I will marry you”! My best friend, my rock, my sweet man, my encourager, my warm hand to hold, my leader, my kind voice telling me it is all going to be okay in any situation, the man who sends me God’s word when I’m having a bad day, the man who prays for me, the man who makes me so happy – I am finally going to be your wife! What a blessing! After we both cried and hugged and kissed we began walking back to the car. How surreal. What do you do after this great big moment in life has just happened?! Well, you call your mama, that’s what! I called my mother and she answered…the first thing I said to her…you lied! (HAHA). 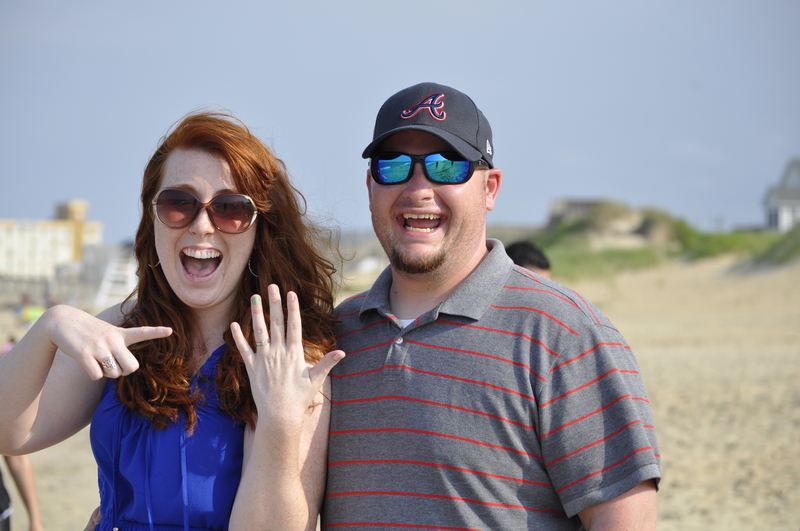 She began to cry and said “Oh baby, I am so happy for you!” My family already knew this was happening this weekend. They did a wonderful job keeping it from me! My sweet mama told me I had a wonderful man who I was going to marry, and we shared sweet words of happiness. My family had been keeping themselves busy all day waiting for the call! Spencer then called his mother, and she, too, was so very excited! She was in on the whole thing as well! Spencer told me it was his turn to drive and would not tell me where we were going. We ended up at the Sea Foam Motel, one of our favorite little mom and pop hotels on the ocean. We went to a room and it was decorated with flowers from my parents and a gift from Spencer. What a surprise! Spencer had gotten me a bathing suit cover up, drink holder, and beach bag all with my future initials on them! This man sure knows me, and the way to my heart! Who could be behind setting the room up like this? Spencer has been with me all day? Spencer led me to the beach where Drew (his brother) and Brittaney (his brother’s girlfriend) were waiting! We exchanged congratulations, hugs, and “Ya did good bubs”! We then headed to the beach, Drew had brought his camera and he took some amazing pictures of Spencer and I as a newly engaged couple! Thank you Drew, I will cherish these pictures forever! You captured the pure joy we are both feeling! After we said our goodbyes to them, we headed back to get ready for dinner that night…Spencer said the surprises didn’t end there! My amazing parents had sent a gift card over to Sugar Creek (our favorite restaurant) for us to have dinner that night to celebrate! We celebrated with our favorite crab dip and crab legs. The sweet ladies behind us at dinner said, “I don’t know what you are celebrating but I hope you have a wonderful evening.” I told her we were celebrating our engagement, and she clapped and laughed with joy and said to Spencer, “I can tell you have a good one here!” We finished up dinner and headed back to the Sea Foam, put on pajamas and headed to walk on the pier. We grabbed some ice cream and walked…hand in hand. I was holding the hand of my fiancé – that is so weird to say, but I love it! 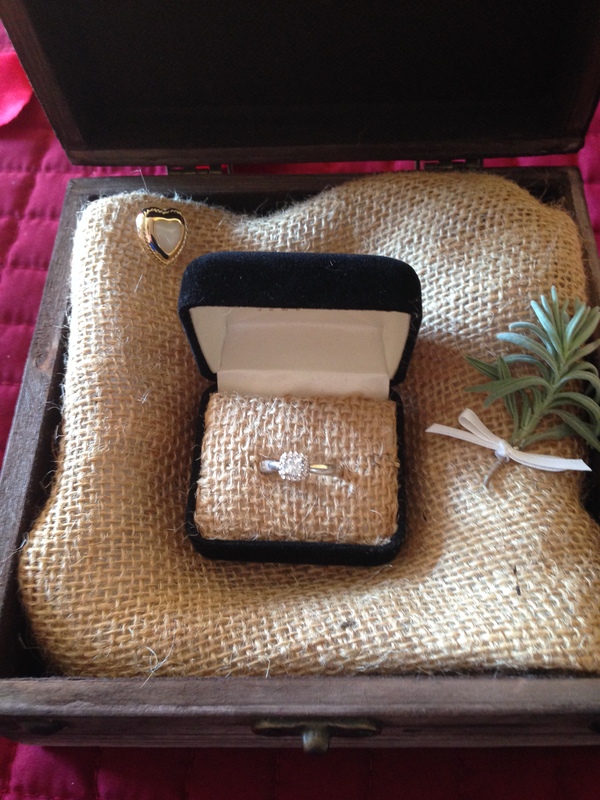 I loved the way he smiled at me, looked in to my eyes, and as we walked holding hands, he would touch my ring – like he was so proud and so relieved it was finally here. Well, Sunday comes and it’s time to head home – back to reality – we stopped in Manteo one last time to soak it all up and take a few pictures. We also stopped at a store and bought a beautiful canvas picture of the lighthouse – this picture means so much to me now. I had seen it the previous day and loved it, but then after Spencer’s proposal, I knew I had to go back and get it! Well, we headed out of Manteo and began to drive home. On the way home I get a call from my sweet mama, and she asks to meet us for dinner. We meet in one of our favorite spots – the Cheese shop in Williamsburg. When Spencer and I arrived, there was a precious sign out front congratulating us on our engagement! We had a wonderful dinner with my family where they showered me with gifts of meaning…lavender plants, rosemary plants, lavender soap and lavender water – knowing that I want lavender in my wedding and the amazing representation that lavender has – love and devotion. My sweet daddy made a toast and wished the future bride and groom many blessings! Monday shortly came and life has gone on – but I have this amazing joy and excitement knowing that in 11 short months, I will be Mrs. Lamb. I will have married my best friend and the amazing man I have been dating for 7 years. I am more than ready to be his wife! I am trying, though, to also slow down and enjoy these moments of my life. Life can pass us by so quickly. I am enjoying each moment with my sweet family and cherishing this time of new beginnings and new chapters in our lives…God really is working through all things and teaching us. He is showing love through the simple things in life, and giving unexpected blessings. God, thank you for this amazing life I have been given. Thank you for allowing me to spend it with the most amazing people I could ask for that I call my family. Thank you for my sweet Spencer and the amazing man he is and allowing me to be his future bride. Victoria, while reading this beautiful, heartfelt rememberance of a precious weekend, I shed tears of joy for both you and Spencer. Cherish every moment for you have the rest of you lives together. I love you and blessings to you both and your marriage. 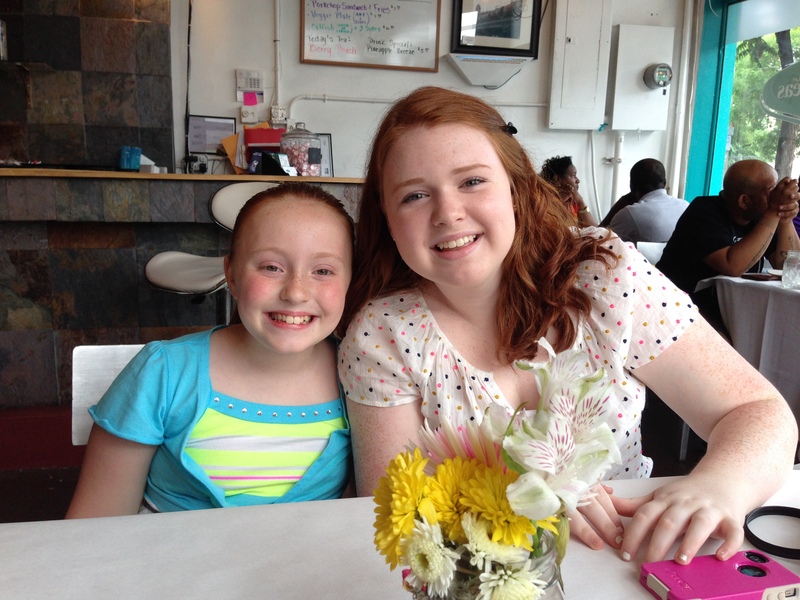 Thank you for sharing this amazing story and writing it as if we were there with you! The Joy we feel as a family is overwhelming when we receive messages like this from you–our loved ones. Thank you so much for caring and sharing. What a sweet sweet story! 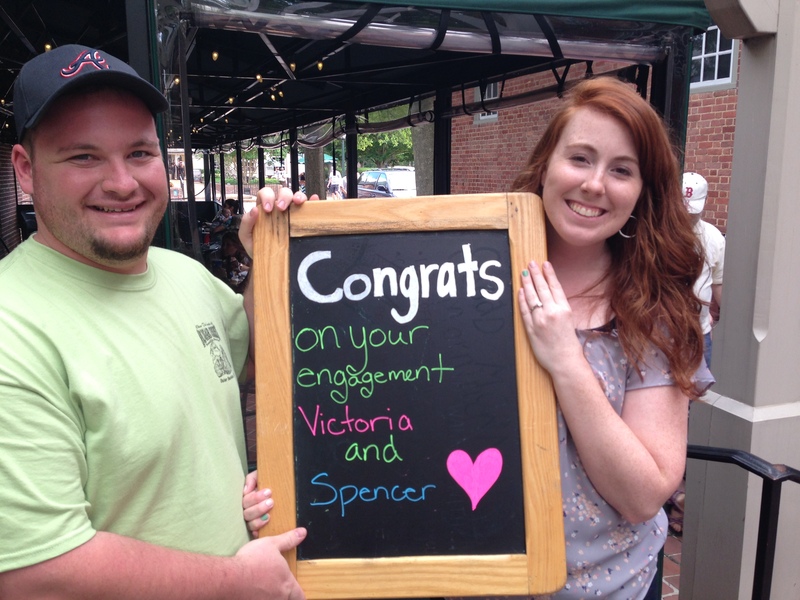 Congratulations to Victoria and Spencer!! congratulations! That was a beautiful story. Thank you Char! We are happy for them!